Set a rack in the lower-middle level of the oven and heat the oven to 375. 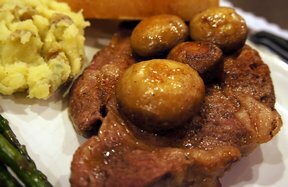 Toss the mushrooms and the onions in a 9x13x2-inch glass pan. 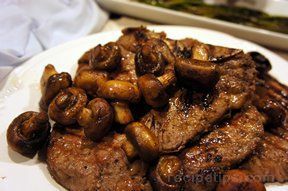 Mix the wine, olive oil, 1 1/2 teaspoons of the garlic, thyme, salt, and pepper, pour over mushrooms, and toss to blend. Cover the pan tightly with foil and roast for 35 minutes. 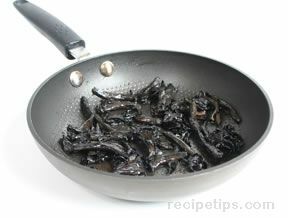 Uncover pan and continue to roast until the liquid has completely evaporated and the mushrooms are beginning to brown, 5 to 15 minutes longer. Add the basil and remaining 1 teaspoon minced garlic and toss. Tip: Mushrooms can be roasted a day ahead: cover and refrigerate. To serve, bring to room temperature, toss with a little oil, and return to the oven until heated through. Toss with the basil.